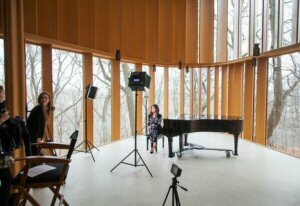 TORONTO, ONTARIO--(Marketwired - Dec. 7, 2015) - The memory of a significant influence in Canadian music and philanthropy was honoured by award-winning singer-songwriter Chantal Kreviazuk in an exclusive video shoot at Canada's iconic Integral House. The private residence, commissioned by the late, renowned mathematician and professional violinist James Stewart, served as the breathtaking backdrop to the music video for Kreviazuk's latest single 'Into Me'. The official video features two ballet dancers awakening in the morning and shifting through the estate's impressive interiors. 'Into Me' is the first single in Kreviazuk's new studio album, which is set for release this spring. A true legacy of architecture, classical music and mathematics, Integral House is regarded as "one of the most important private houses built in North America" by Glenn D. Lowry, director of New York's MoMA. A reflection of Stewart's intense passion for music, the 18,000 square foot residence boasts a performance space for over 150 people that has hosted benefit concerts, philanthropic events and the world's greatest musical talents. A generous patron of Canadian music during his lifetime, one of Stewart's final and most notable contributions is still pending: proceeds from the sale of Integral House, listed at $22.9 million CAD by Paul Maranger, Christian Vermast and Fran Bennett of Sotheby's International Realty Canada, will be donated to organizations he supported, including those contributing to Canadian arts and culture. "Integral House is significant not only as an architectural gem, but as one of the most recognizable and unique landmarks in the Canadian arts and music landscape," says Paul Maranger, Broker and Senior Vice President, Sales for Sotheby's International Realty Canada in Toronto. "We are pleased to see the estate continue to play an important role in elevating Canadian music, just as it did during Dr. Stewart's lifetime." 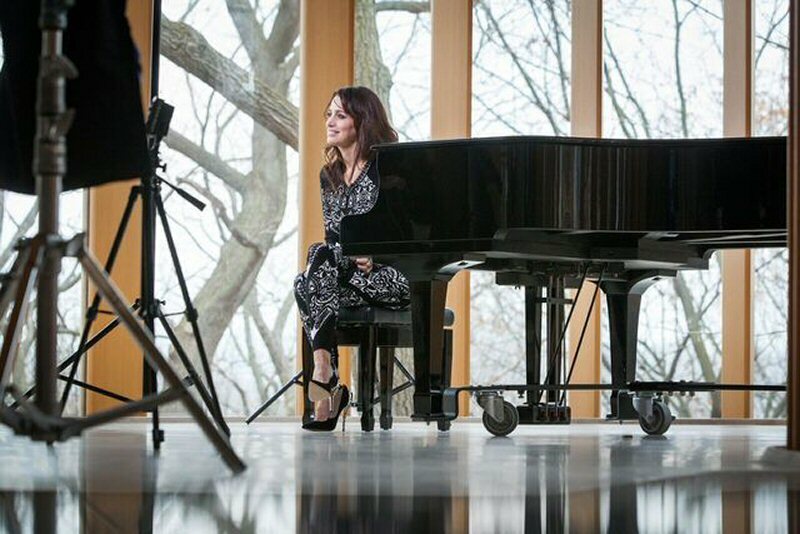 Kreviazuk, a notable philanthropist who most recently received the Order of Canada for her contribution to human rights causes, notes that the filming of her latest music video at Integral House pays homage to Stewart's legacy. 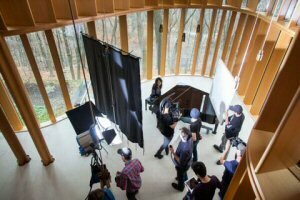 "The decision to shoot 'Into Me' at Integral House was made not only because we felt the estate would be architecturally stunning," says Kreviazuk, "It was also a way to honour the incredible impact that this remarkable man had on Canadian music and society as a whole." Combining the world's most prestigious real estate brand with local market knowledge and specialized marketing expertise, Sotheby's International Realty Canada is the leading real estate sales and marketing company for the country's most exceptional properties. With offices in over 30 residential and resort markets nationwide, our professional associates provide the highest caliber of real estate service, unrivaled local and international marketing solutions and a global affiliate sales network of approximately 725 offices in more than 50 countries to manage the real estate portfolios of discerning clients from around the world. For further information, visit www.sothebysrealty.ca. Chantal Kreviazuk in an exclusive video shoot for her new single 'Into Me' at Canada's iconic Integral House. Reflecting the late - Dr. James Stewart's passion for music, the 18,000 sq.ft. residence boasts a performance space for over 150 people. Integral House overlooks the Rosedale Ravine in Toronto, a breathtaking backdrop for the video. The official video for 'Into Me' features two ballet dancers shifting through the estate's interiors, including the home's impressive indoor pool. Behind the camera view of the dancers in 'Into Me', the first single in Kreviazuk's new studio album.